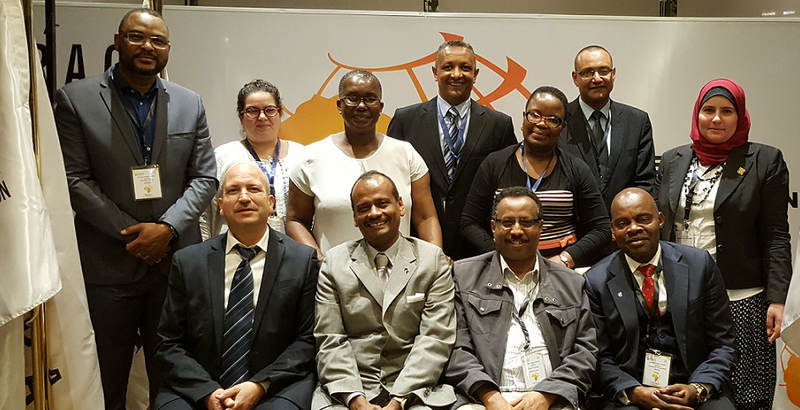 In late September 2017, the African Society for Laboratory Medicine (ASLM) and the accrediting body members of the African Accreditation Cooperation (AFRAC) agreed to sign memorandums of understanding (MOUs) to establish formal collaborations in support of enabling more African laboratories to achieve accreditation to International Standards Organization (ISO) standards. The agreement was reached during a side meeting at AFRAC’s 8th General Assembly and Meetings, held in Cairo, Egypt, 23-29 September 2017, where ASLM representatives Dr Ali Elbireer, CEO, and Mr Teferi Mekonen, Program Manager & SLIPTA Coordinator, met with with the Chair of AFRAC and Executive Directors of its member accrediting bodies, including the Egypt Accreditation Council (EGAG), Ethiopian National Accreditation Office (ENAO), South African National Accreditation System (SANAS), Southern African Development Community Accreditation Service (SADCAS), Kenya Accreditation Service (KENAS), Nigeria National Accreditation Service (NiNAS) and Tunisian Accreditation Council (TUNAC). AFRAC, a regional cooperative body established in 2010 to bring together African accreditation bodies and other stakeholders, facilitates use of accreditation to support development, improve competitiveness and protect public health and safety. ASLM was admitted to AFRAC in 2014 as a Stakeholder Member and has participated since then in a number of general assembly and other AFRAC-organized meetings. At the 8th General Assembly meeting, Dr Elbireer and Mr Mekonen shared ASLM’s strategic vision, mission and goals and reported on SLIPTA-related progress towards international accreditation for African medical laboratories. During the side meeting held of 26 September 2017, ASLM expressed the organization’s appreciation for the role played by the accrediting bodies in the progress achieved to date. More than 20 of the 300 laboratories enrolled in SLIPTA have achieved ISO accreditation. One aim of the planned MOUs is to increase that number very rapidly by building the capacity of ASLM-certified SLIPTA auditors through further training on auditing and ISO requirements. A number of specific action items were agreed upon at the side meeting. These included the need to jointly address new areas, such as blood transfusion and other medical facilities that will need to move towards accreditation in the near future and issues of traceability, calibration, proficiency testing, and supplies. Additionally, meeting attendees agreed on the importance of creating awareness that countries should have national standards, which most African countries lack, with minimum requirements that must be complied with in order for laboratories to legally practice. In order to achieve these and other aims, the signing of MOUs with various accrediting body members of AFRAC is expected to be completed within the next few months.